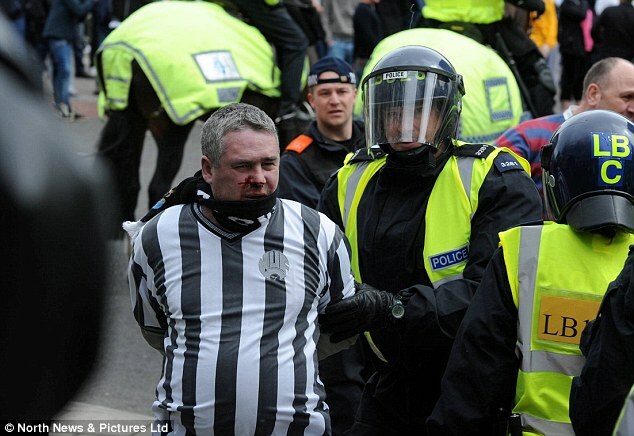 English Premier league side Newcastle have branded a group of their own fans an embarrassment after they rioted in the streets following defeat in the Tyne-Wear derby on Sunday. 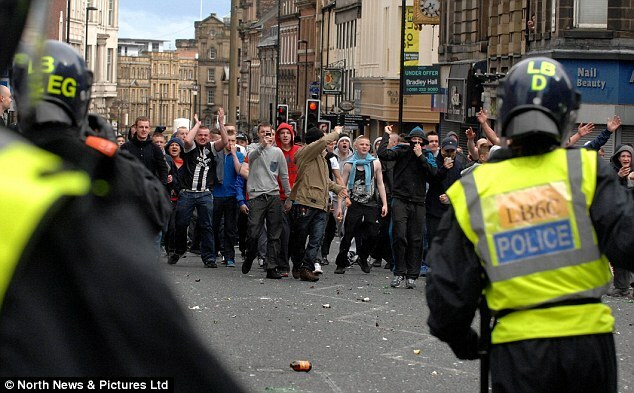 In a statement released by Newcastle this afternoon, the club described supporters involved in the violence near the city's Central Station following the 3-0 defeat by Sunderland as 'deplorable individuals' and promised to issue lifetime bans for those responsible. The statement read: 'We were embarrassed and appalled by the behaviour of a minority of so-called fans who last night were involved in disturbances and disorder in Newcastle city centre after the match. 'Newcastle United have been working with Northumbria Police and will continue to do so in order to identify all of the individuals concerned. 'The club will take the strongest possible action against those involved in the disturbances and will impose immediate lifetime bans on all those found guilty. 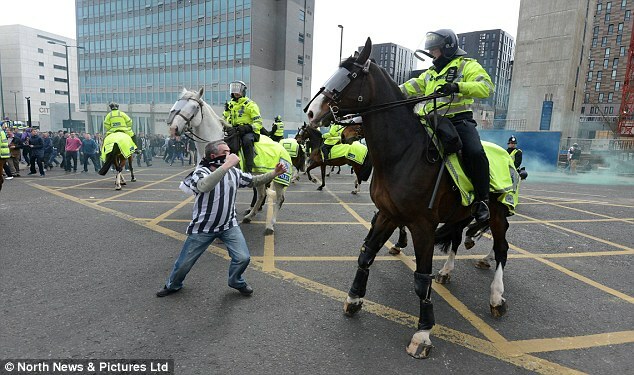 One man in a Newcastle shirt was caught on film punching a police horse before being tackled to the ground and taken away. 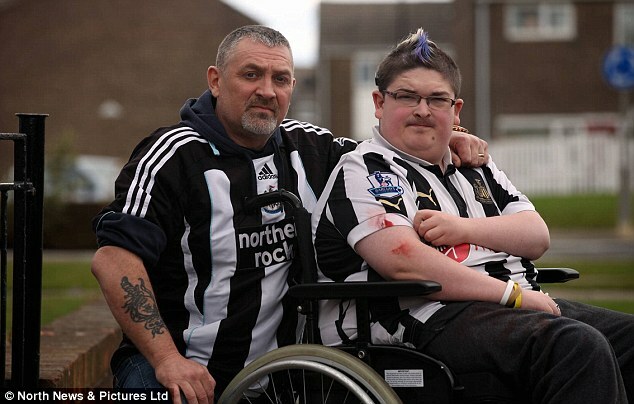 On Monday morning, Northumbria Police chief superintendent Steve Neill vowed to name and shame the culprits – as it emerges a disabled Newcastle fan suffered burns during the derby defeat by Sunderland. 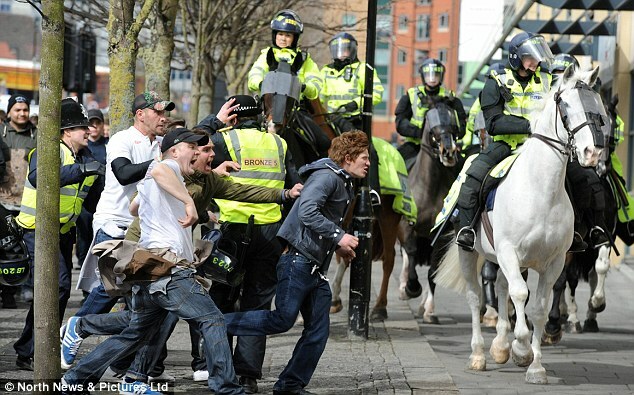 So far, 29 arrests have been made, and all have been bailed with the exception of the fan who struck the horse. Hundreds of people were pictured in the violence and the police have called for anyone who can help catch those involved to come forward.